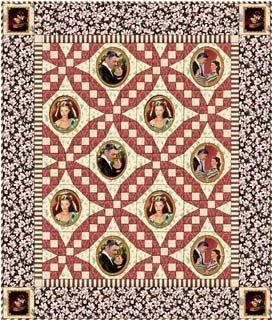 In 2010, Quilting Treasures celebrated the 70th anniversary of the movie "Gone With The Wind" with a fabric line devoted to it called "Gone With The Wind - An American Classic". 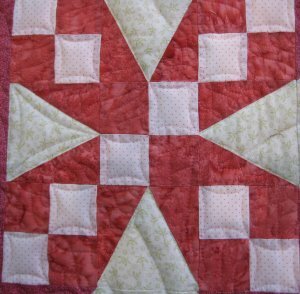 As such, all the component pieces were made from that line ... whether or not the final quilt was esthetically pleasing. And to my taste, it is not. I *love* the center of the quilt. I *love* the optical illusion of the curves when only straight lines are really there. I love the appliqued portraits. 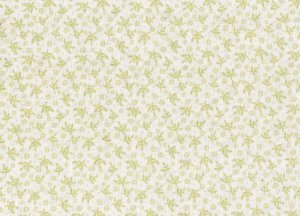 the suggested background fabric is a sprigged all-over print that seemed to be too busy and high contrast for my taste. I think the inner border of a printed stripe is much too busy when butted up against the intricately pieced center. I like the plain borders BUT .. oh my gosh .. NOT in that fabric! Way, way, WAY too busy. I *do* understand the business plan of trying to sell the fabric line, but good gosh ... either make some fabric motifs that work with the pattern that you have or change the pattern to best show off your fabric line! the background fabric: I used a much more subtle fabric. I think it sets off the appliqued pictures much better. I replaced the striped fabric inner border with a coral fabric. 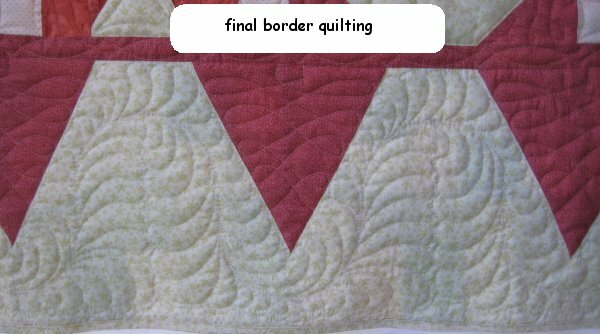 I completely changed the border from a slab-o-border to a pieced border. Since my quilt was much bigger than the original pattern, I have more appliqued pictures. (and as an unintended consequence ... drat, I hate them! ... a shortage of fabric down the line). I also ran out of the original coral fabric. I had enough for the pieced blocks (the 4-patches and triangle-in-a-rectangle) (i.e., the non-picture blocks). But since my version was larger than originally planned, I made more of those pieced blocks and therefore ran out when it came time to snowball the appliqued picture blocks and piece the outer border. This was originally designed and made for Rene, our youngest. She adores all things dealing with Gone with the Wind. At a Gaskell's dance, she even portrayed Scarlett O'Hara. I had a picture of her in that role and printed the picture onto fabric. To coordinate with the rest of the pictures on the quilt, I framed her picture like the others and put her picture in the center square. I thought she would like it. It was to be a Christmas present, but I couldn't get it done on time, so I packaged just the top and explained that I would finish it after Christmas. But, to my surprise, when she opened it, I could tell that she really didn't care for it. Now, my girls have all be brought up so that they are to NEVER express dislike of a present to the giver. And so it was to me ... she didn't like it but felt she couldn't be honest with me for fear of hurting my feelings. She knows how much time and effort goes into making a quilt. And for whatever reason, somehow I was not hurt. I think it was because it was a top and not a finished quilt. After pressing her, she said that she really didn't like her picture in the middle. She might have been embarrassed by it? Or maybe she didn't like that particular picture. 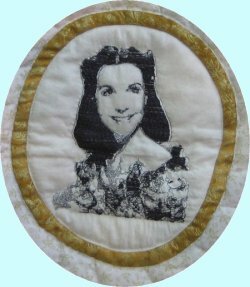 So, I removed the picture and put a machine embroidered picture of Vivien Leigh instead. She still didn't like it. She then admitted that she just didn't care for the entire concept. Wowser ... I didn't see that one coming! But still .. quite honestly, I did not have hurt feelings over this. I was glad that she told me. I absolutely would not have liked giving her a quilt that she didn't like. As it happened, my niece, Angela, popped up with the comment that SHE liked it! Done! The quilt was now Angela's! I told her not to hold her breath but when I finished it, the quilt would be hers. Let us fast forward to 2012. 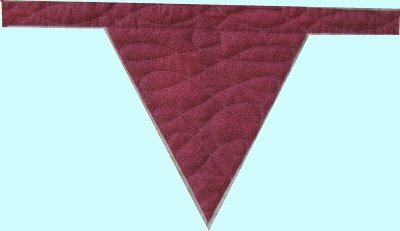 I've finally decided that I need to put my piecing on hiatus and concentrate on quilting the SEVENTEEN tops I have laying around. Angela's "Gone with the Wind" was on the top of the list, so I went to work on it. After looking at the entire top and NOT coming up with an Instant Inspiration, I decided to work on the areas that I knew I had ideas for. The pale squares on the diagonal would get continuous curves. 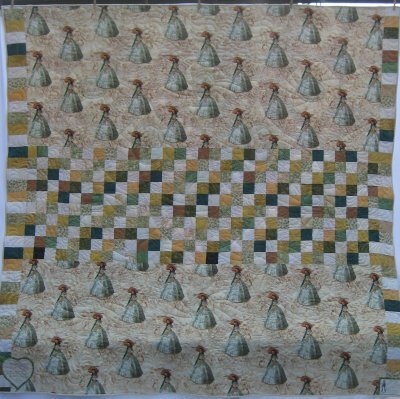 They look nice and are easy to quilt. I used an ecru thread so it wouldn't show. I dithered between an oval and piano key design for the outer border or a meander feather design. I had just purchased some curved templates for curved cross-hatching and was DYING to use them. BUT ... I finally thought to ask Angela which she liked and feathers won. This was also done in ecru thread. I had marked the spine of the border feathers with one of those disappearing purple markers that have an 'eraser' on the end. I used a light touch. I normally don't use markers like this; I usually use chalk but recent discussion on the quilting forums prompted me to give the marker a chance. I must say that I've been disappointed. While part of the purple marking disappeared (as was advertised that it should), some did not. There was no difference in the fabric between the different areas, so I am at a loss for an explanation. I spritzed a small area with water and sure enough, the markings did disappear. So with that little bit of confidence, I tossed the entire quilt into the washing machine ... cold water wash and rinse. When done, I examined the quilt to make sure all of the purple markings had been washed out ... and heck, they had NOT. I was very surprised. I tossed it in for a second washing but first I rubbed "Shout" over the entire spine area. That did the trick but I still threw away the purple marker. I'm pretty pleased with the way the feathers in the corners turned out. The triangles that extended into the borders got a loopy design. This was done in a very pale pink thread. the narrow sashing between the border and the interior got a traditional egg-and-dart design. This also used the very pale pink thread. 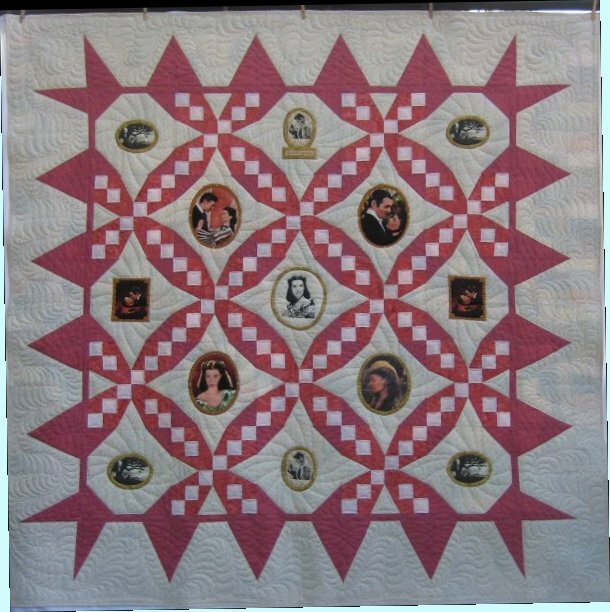 Eventually, that left me with the difficult parts ... the background of the appliqued pictures and the rest of the coral fabric pieces that surrounded the diagonal pale squares. The background behind the pictures posed a quandry. I needed something to hold the background down but really didn't want to stipple it. And all-over background and echo quilting around the applique didn't seem right either. 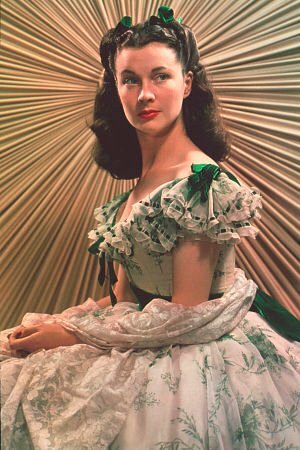 Finally, seeing a picture of Vivien Leigh in front of a gathered fabric background gave me the inspiration for a curved, radiating line design. I had just purchased a ruler that would make such radiating lines possible but I don't think I read the directions properly as the lines are not evenly spaced, as they should be. Obviously, I need to practice using the ruler some more. That left the oddball coral triangles that were part of the interior. They were such weird angles that I couldn't think of anything that would work. I thought to use more continuous curves but because of the oddball angles, they didn't look right to me. In desperation, I simply did another loopy design but in coordinating thread color so you wouldn't see it. 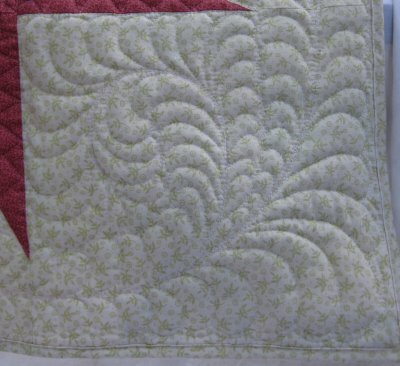 All in all, everything worked but I have this small feeling that the quilting design could have been done better. 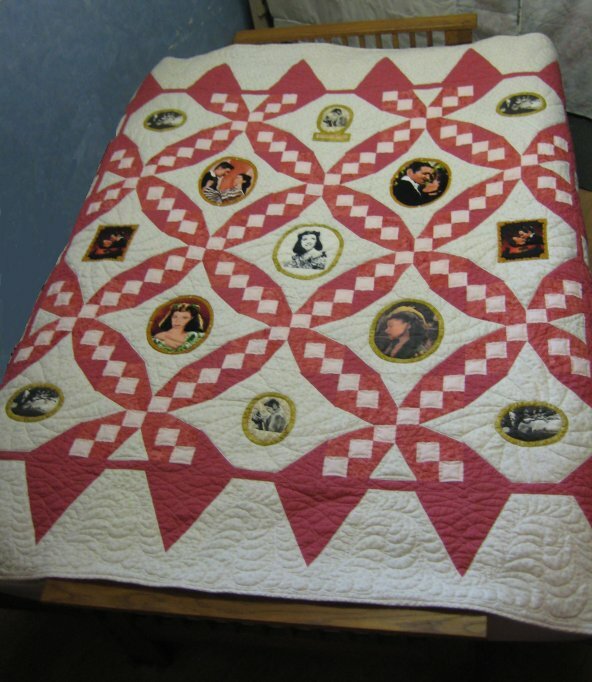 If I had waited until that "something better" came along, I rather think that the quilt would STILL be on the frame. So, it's better done than perfect. As for the backing ... for quite a while, I have been using 108" wide natural muslin. I like having a seamless backing. It makes my quilting life easier. However, I had purchased some of the coordinating print to be used as the backing ... but I hadn't originally planned on such a BIG quilt being made. The amount of fabric I purchased simply would not cover the entire back of the quilt, neither width-wise nor lengthwise. I was in serious doo-doo, as the fabric was out of print. So, using coordinating colors, I sewed together some squares for a BIG strip in the middle and the strips for a piano key outer edge to make the backing big enough. 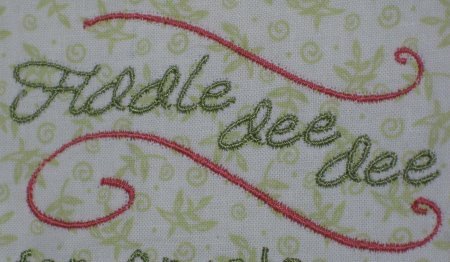 The Embroidery Part From Amazing Designs, I serendipitously found a free design with the words "Fiddle dee dee"! How perfect! (I can't find this freebie on their website any longer). The only aspect that I was concerned about was the outline stitches. The fabric being embroidered needs to be stabilized properly AND the design needs to be digitized properly for the outline stitches to track properly. Well, I'm not quite sure what happened here ... the words and the curved accent lines stitched out perfect. Satin stitching doesn't always look nice but this really did. Then came the outline stitching. It was awful. The tension between the top thread and the bobbin thread went haywire. There was absolutely NO tension from the bobbin. I saw that the top stitches looked loose and when the stitching was done, I saw that on the back of the piece, the bobbin thread was just lying on the fabric. The only resolution was to remove all the outline stitching. All I had to do was pull on the bobbin thread and it slipped right through the loops from the top. Once I removed the top thread, the design still looked fine. In fact, you really couldn't tell that there had ever been an outline stitch. 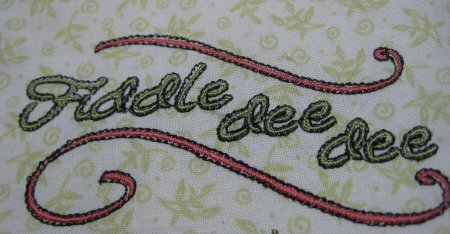 After the Fiddle dee dee was stitched, the remaining dedication wording was done. These small satin letters came from Skeldale House. They are absolutely perfectly digitized. Such a delight to stitch out! It is available on her Yahoo group. 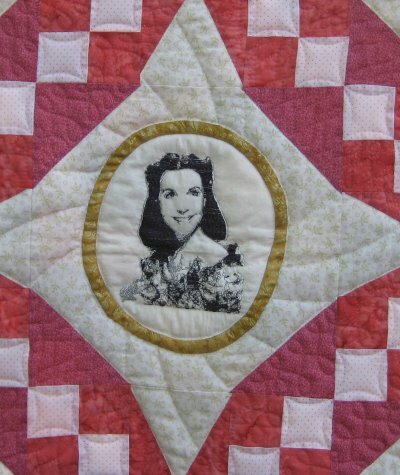 In the center of the quilt, I appliqued a machine embroidered picture of Scarlett O'Hara. 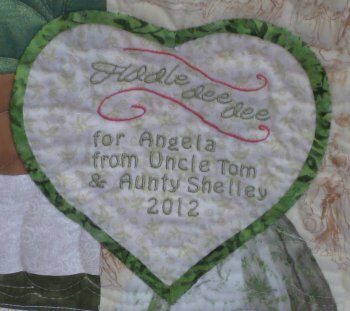 This was a purchased design from Advanced-Embroidery-Designs. And how it looks on a queen sized futon.